Along with Pancha berams, garbha griha also hosts panchaloha deities of Sita, Rama, Lakshmana, Rukmini, Sri Krishna swamy, Chakratalwar. The temple hosts the deities of Garuda, Yoga Narasimha, Varadaraja, Kubera, Bedi Anjaneya in their respective sub-shrines. The temple also host the deities of Anantha, Garuda, Viswaksena, Sugriva, Ramanuja. Vimana Venkateswara is the exact replica idol of Venkateswara carved on the Ananda Nilayam Viamana's second tier north west corner. 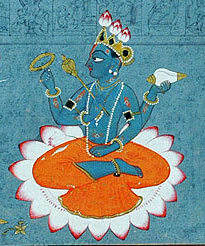 ^ Koutha, Nirmala Kumari (January 1, 1998). History of the Hindu Religious Endowments in Andhra Pradesh. Northern Book Centre. p. 124. ISBN 81-7211-085-5. ^ a b c Koutha, Nirmala Kumari (January 1, 1998). History of the Hindu Religious Endowments in Andhra Pradesh. Northern Book Centre. p. 136. ISBN 81-7211-085-5. ^ "Tirumala Tirupati Devasthanams-Arjitha Sevas". Retrieved 2015-08-18. ^ "Early closure of Srivari Mettu footpath mooted". The Hindu. Retrieved 2017-08-20. 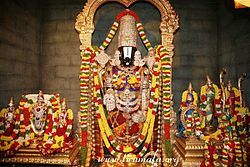 ^ "Tirumala- The Paradise of Festivals". Retrieved 2015-06-07. "Tirumala Temple History". Tirumala Tirupati Devasthanams. Retrieved 2015-08-27. "Sri Bhu Varaha Swamy Temple". Tirumala Tirupati Devasthanams. Retrieved 2015-08-27. "Sri Bedi Anjaneya Swamy Temple". Tirumala Tirupati Devasthanams. Retrieved 2015-08-27.